I wanted to see if I could track down the original Felt Town article in a Ladies Home Journal back issue based on what little information I had. That it appeared on back page of the issue from (Gram’s interview) and that Anne received one (she thinks) when she was six years old in 1951. It was not able to search online back dated issues earlier than the 1970’s, so I went to the big main public library in downtown Santa Monica. I asked the periodicals representative how to search for the information an as it turned out pretty much every issue ever printed is available in bound volumes on the library’s periodical shelves. This seemed both a blessing and a curse. I felt confident that I would indeed find the article, but that it might take looking through hundreds of issues in the search. Luck for me my son Jack was along and eager to help in the search. I decided to start by using the information I had, just looking at the last few pages of each issue over say a five year period starting in 1950. After a few issues it was clear that the back page, or close to it, always had a project that was “felt town-esque”, a quilt or some other home made knitting project. This got me excited. A few times I even though, could this be the article? 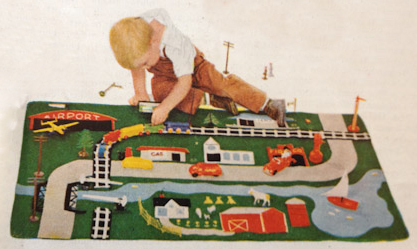 It is not felt town, but perhaps Grams had engineered Felt Town based on just a quilt design. Of course I could not have been more wrong. 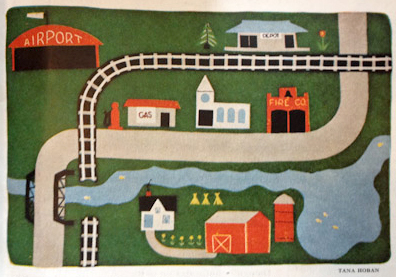 This entry was posted in Felt Town in the World, History of Felt Town. Bookmark the permalink.